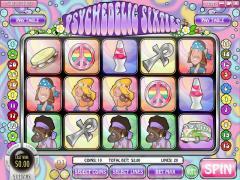 Psychedelic Sixties takes players back to the hippie generation that came into prominence in the 1960s. As expected, Psychedelic Sixties has great background music. The music consists of a typical tune of the 60s played on simple instruments. Most of the symbols exhibit excellent animations. The Biker bursts into a song, the Hippie Man shows a white flower, the Hippie Woman shows the peace sign, the Tambourine start shaking and emitting notes and the Smiley Face sticks out a tongue. 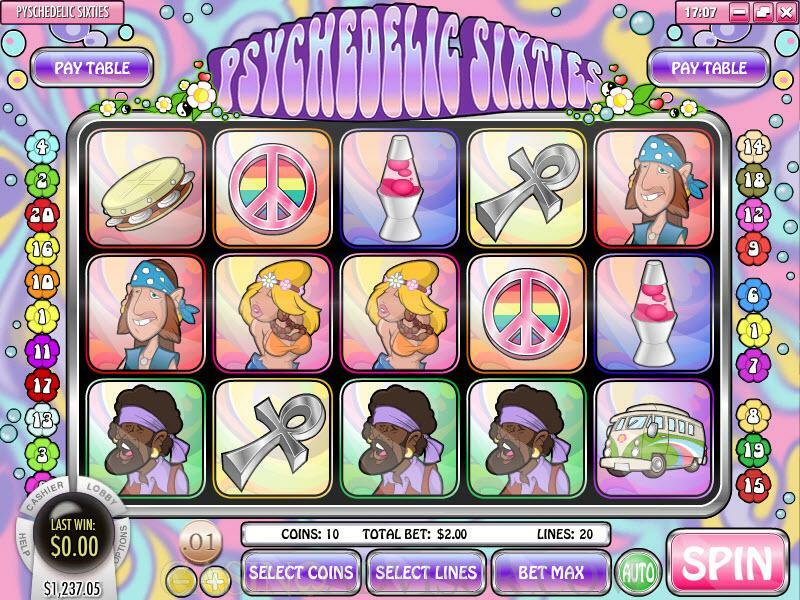 The coin denominations offered in Psychedelic Sixties are 0.01, 0.05 and 0.10, which essentially makes it a slot game for low rollers. Players can wager up to 10 coins per payline. There are 20 paylines in the game. The betting options can be selected by manipulating the buttons below the reels. The Heart wild symbol appears only on the first three reels. Apart from substituting for other symbols it also acts as a multiplier. The value of the multiplier is equal to the number of Heart symbols on the reels. The Motorcycle is the scatter symbol, but it does not offer scatter payouts. Three or more Motorcycle symbols on the reels trigger 10 free spins with a 5x multiplier. In the free spins round the wild symbols become expanding wilds. 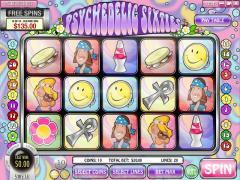 Psychedelic Sixties is an I-slot. Therefore its special feature is the bonus round that is triggered by the presence of three or more Bus symbols on the reels. In each bonus round the player is taken to a different city. The journey covers New York, London, Paris, Tuscany and Tokyo. At each city there are a number of hippie hitchhikers who want to get onto the bus to go to the rock concert. Players click on the hitchhiker and the bus comes there. As the hitchhiker boards the bus he offers the player a random number of credits for being given the ride. If the player manages to visit all the cities in a single game then he gets taken to the rock concert where he can win further credits. There is no progressive jackpot in Psychedelic Sixties. However the fixed jackpots pay out quite well. 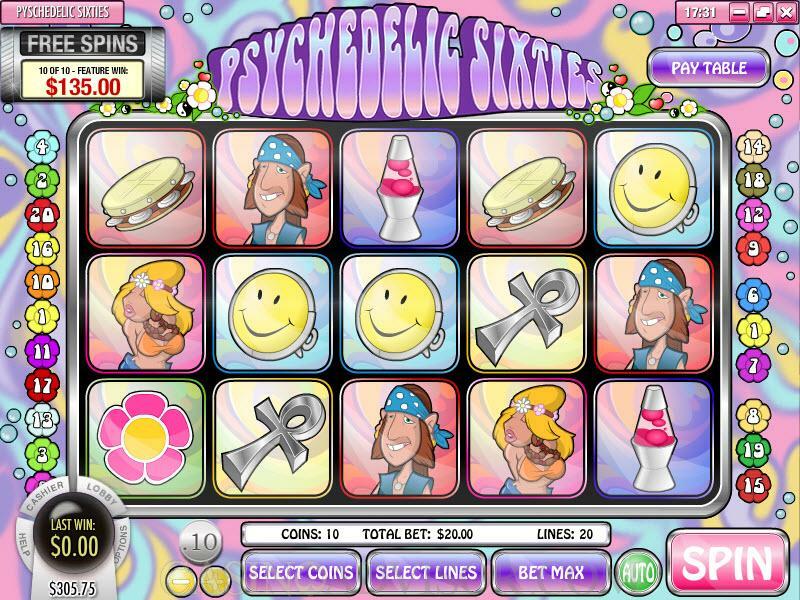 The Power Flower symbol is designated as the jackpot symbol and pays out the highest fixed jackpot of 2000 coins when five of these symbols appear in an enabled payline. The second jackpot associated with the Biker symbol pays out 1500 coins. The other five symbol payouts are quite small. Interested in reading more detailed information about Psychedelic Sixties? If so Click Here for more details.